Thought I’d share some of my Gem City Comic Con finds from today! I go to these shows primarily to dig through the quarter bins and I found about a box worth of reading for the next few months. I’m going to drop in on the Gem City Comic Con this weekend! Since moving to the Midwest, I’ve enjoyed going to these smaller, regional comic shows. The ones in Southwest Ohio aren’t the cattle calls that San Diego and the NYCC seem to be and the few I’ve attended have done a good job at attracting guests and talent. The GCCC is a show I’ve watched grow by leaps and bounds over the last three years and I’m excited to check out this year’s convention in their new, bigger location. 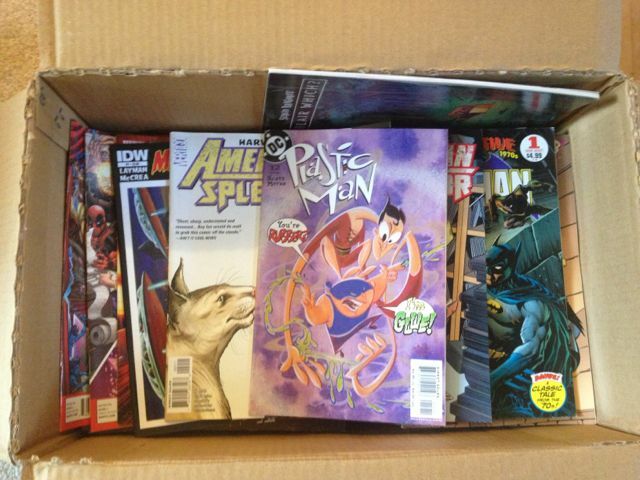 My main reason for going to conventions these days is to dig through long boxes and find comics to read. My tastes run pretty cheap and I spend the majority of my time combing through the quarter bins, trying to complete my runs of certain comic series and trying to find oddball books I’ve never read before. To give you an idea of what I’m talking about, one of my favorite finds from last year’s Gem City Comic Con was this adaptation of the mid 1990’s Saturday morning cartoon Camp Candy, starring John Candy. I don’t imagine you’ll find anyone chomping at the bit to collect Camp Candy, but I was pleased to find such a weird comic book. There are a couple of dealers at these shows who offer big discounts on their recent stock and I’m going to try and pick up some issues of things I missed in the past year. I’m not a fan of the X-Men usually but the handful of issues I’ve read in Jason Aaron’s run on Wolverine and the X-Men have been really fun. I wouldn’t pay $4 dollars every two weeks for the book, but I’ll scoop up a whole bunch of them for a buck apiece at a con. There, you have a book that’s not going to be hurt too badly sales-wise by my frugality. The guests at the Gem City Comic Con have been pretty great for such a small convention; I was thrilled last year to get to talk with Mark Waid, one of my favorite superhero comic writers of all time. This year, I’m jazzed about meeting Howard Chaykin. He’s been a creator whose work I’ve followed for the better part of my time as a comics fan. I remember discovering a cache of the first 10 issues of American Flagg! in an antique store back home in the Hudson Valley. 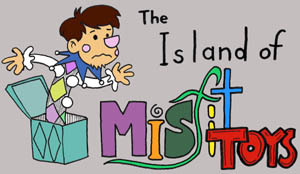 Those books looked like nothing I’d ever seen before and I read them to pieces! I’m going to get my nice AF! hardcover signed by the guy, as well as my copy of The 1994 Marvel Holiday Special (which I wrote about in great detail here, if you’re interested). I’m also excited about seeing Stan Sakai; Usagi Yojimbo is an occasional trade-read for me but c’mon! That character’s been around forever! I remember buying the action figure when I was into Teenage Mutant Ninja Turtles as a kid! 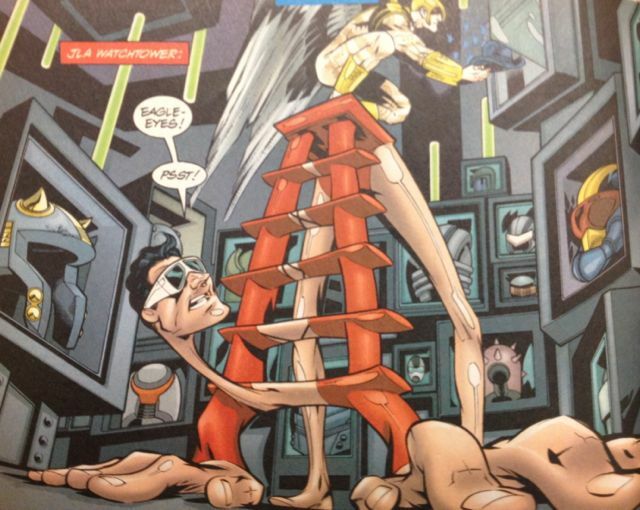 In our ramp up to The Odyssey, I do a lesson based around Grant Morrison’s run on JLA. Morrison famously drew on Greek archetypes to craft his ultimate version of the Justice League of America. 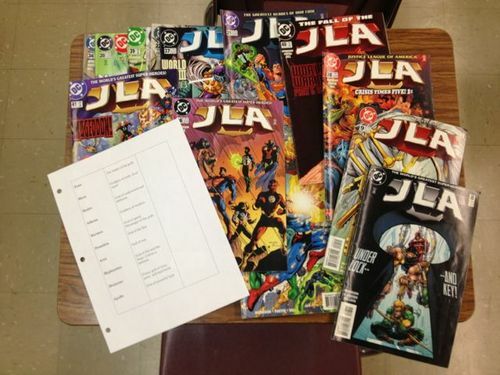 After a quick discussion about the Greek pantheon, I pair students up, give each pairing a copy of JLA and ask them to flip through the comics and find as many parallels between superheroes and Greek gods as they can. After 15 minutes, they present their findings to the class on the document camera. to great effect as proxys for and Dionysus and Hephaestus. The best part about this lesson is when students go off book and bring up other examples of superheroes who display Greek ideals… or talk about how American superheroes embody American ideals. More on that tomorrow. This past week, The International Toy Fair was held in Manhattan. This is a business convention for toy makers and purveyors to show their wares to stores. In recent years it’s become somewhat of a bonanza for toy collectors who wait breathlessly for announcements of they new action figures and accessories to add to their collections. I’m always interested in seeing what new toys are on offer for the year, but I haven’t had a lot of disposable income in recent years. Most of the stuff in my collection is either an individual figure cherrypicked at full price, a gift from someone, or (most often) something bought on clearance. Having said that, there is one toy line I manage to follow with some regularity, and that’s Art Asylum’s Minimates. Again, I don’t buy EVERY Minimate Diamond Select Toys puts out… but I buy a lot of them and enjoy the blocky style. I have a fairly decent collection. Although DST has produced some mighty tempting offerings recently including their series based on The Walking Dead comics, I haven’t been bit by the collector bug since the introduction of their Ghostbusters line. All that’s about to change however. This weekend, Diamond Select Toys and Art Asylum announced Minimates based on one of my favorite movies of all time, 1986’s Aliens. While I’ve seen no pictures as of yet, the press release says that their license will cover Minimates of major characters AND vehicles. I’m hoping this means we’ll not only get a full platoon of Colonial Marines, but a Drop Ship and… dare I hope… a Power Loader. I’m assuming a lot of the excitement for this line will be born out of the soon-to-be released Aliens: Colonial Marines video game, which isn’t getting a lot of great reviews. Hopefully that game’s performance won’t affect these Minimates. Last night, Ellen and I went to see Marc Maron perform stand-up at Bogart’s in Cincinnati. Maron’s become the poster boy for the podcast generation and for good reason- his WTF is a medium-defining program and one I listen to every week. I’ve been a fan of Maron’s since I was a teenager and he did regular work on Comedy Central. Maron’s always used his stand-up and podcast as a forum as a kind of therapy to exercise his demons and I think that’s one of the reasons the guy’s so appealing today. Although I remember watching the guy on things like Stand Up Stand Up and SAST as a brash young comic, middle age suits Maron, his persnickety personality and obsessiveness. Anyhow, the show was good; Ellen and I both enjoyed it. It was interesting to see Ellen’s reaction, as she’s not a regular listener to WTF. After the show, she remarked about what a communal thing the show seemed to be for Maron and his fans, with people shouting out their favorite bits and Maron directly referencing stuff that happened on the podcast. This is probably a good thing; Maron knows his audience and realizes most of them will immediately get it when he starts talking about Boomer or Pete Holmes. Ellen was lost on that stuff but appreciated the rest. I didn’t stick around for the meet n’ greet after the show. Although I appreciate that Maron does that stuff, I’ve always found the fan impulse to get a picture with whoever they’re a fan of vaguely icky. The best way I can be a fan is support the artist with some cash (I did buy the iPhone app, thanks much!) and leave him alone. I know if the situation were reversed somehow, that’s what I’d want. THESE ARE FANTASTIC. No fooling. 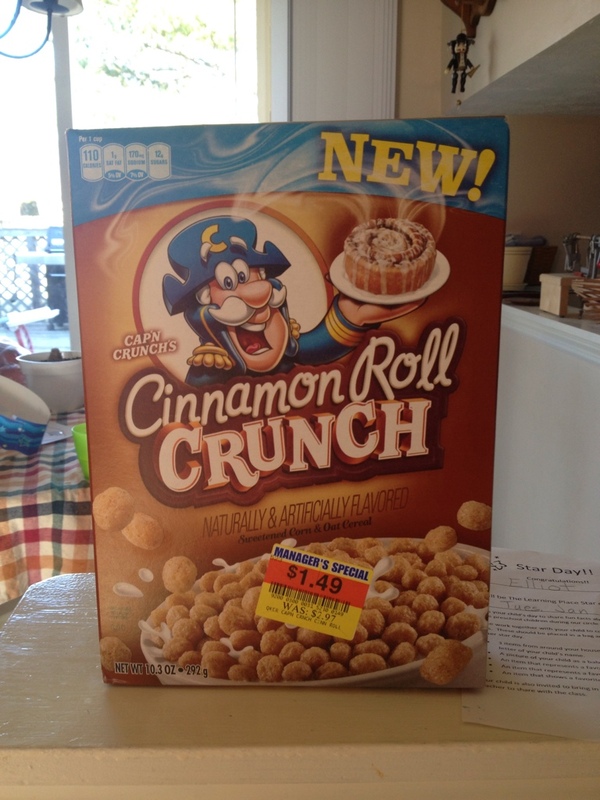 I’m already a bit of a connoisseur of the good Cap’n but I was genuinely impressed with his latest foray into diabetes inducing breakfast treats. Ellen picked up a box on Manager’s Special and I immediately drove back to the store and bought two more closeout boxes. THAT’S THE KIND OF GUY I AM. Luckily, Quaker Oats isn’t looking to bring the line to a close. These were just boxes of cereal that got dinged up during transport. BUY THEM NOW OR LOSE THEM FOREVER. After reading a couple of reviews and profiles online, I picked up Petra Goes to the Movies, the cover album from singer Petra Haden. Haden’s best known for her a cappella renditions of The Who Sell Out and other pop songs. Her version of Journey’s Don’t Stop Believin’ was pretty blatantly ripped off by the producers of Glee for their TV show’s soundtrack. On Petra Goes to the Movies, Haden tackles movie scores; a daunting challenge for any vocalist. By and large, it’s a success. Haden made some smart choices, eschewing some of more obviously bombastic cinematic music for some understated tunes. Her versions of God’s Lonely Man from Taxi Driver and Bernard Hermann’s theme to Psycho are terrific. She doesn’t completely forget about the spectacle though, with two tracks taken from John Williams’ score for 1978’s Superman: The Movie. I would say the biggest problem with Petra Goes to the Movies is that the gimmick plays itself out after a few tracks. There’s some impressive vocal work on here and a fun listen… but the work is essentially a novelty and once that’s run its’ course, you may find you’re not as enchanted as you initially were. At any rate, I highly recommend those four tracks I mentioned. I also wanted to take a moment to mention a podcast I’ve listened to quite a bit over the last six years. As a regular reader of comic books, I’ve often enjoyed the weekly Pick of the Week Podcast from iFanboy. One of the great joys of the world of podcasting is the way with which hobbies and their intricacies can be focused on with laser like precision. For me, iFanboy serves that purpose. It’s a great way to stay in touch with the comic market especially during times when I’ve lost enthusiasm for certain areas/genres being serviced by that market. Ron Richards, one of the original three hosts of the Pick of the Week Podcast, airs his last episode this coming week, moving onto a job as Director of Business Development at Image Comics. I’ll definitely miss Richards’ contributions to my Monday afternoon/Tuesday morning commute and wish the guy well in his future endeavors. Starting tomorrow, I’m trying out a new weekly feature! I’m going to be looking at weird, silly, and otherwise strange toys and writing about why I think they might not have been successful. Hopefully it will be kind of fun. This past September, I was at the Cincinnati Comic Expo, waiting in line to get my copy of Saga of the Swamp Thing hardcover signed by artist Rick Veitch. Veitch is a well-known collaborator of comic writer extraordinaire Alan Moore. Although I like what they did together on Swamp Thing, my absolute favorite paring of Moore and Veitch was their work on Supreme. until, while waiting on line, I saw a guy with THIS BOOK. I couldn’t help but ask him where he’d gotten this massive omnibus collection. The dude seemed pretty pleased with himself and explained: This hardcover was a custom-bound collection of EVERY issue of Alan Moore’s run on Supreme, including every guest appearance written by Moore featuring the characters from the Supreme universe. 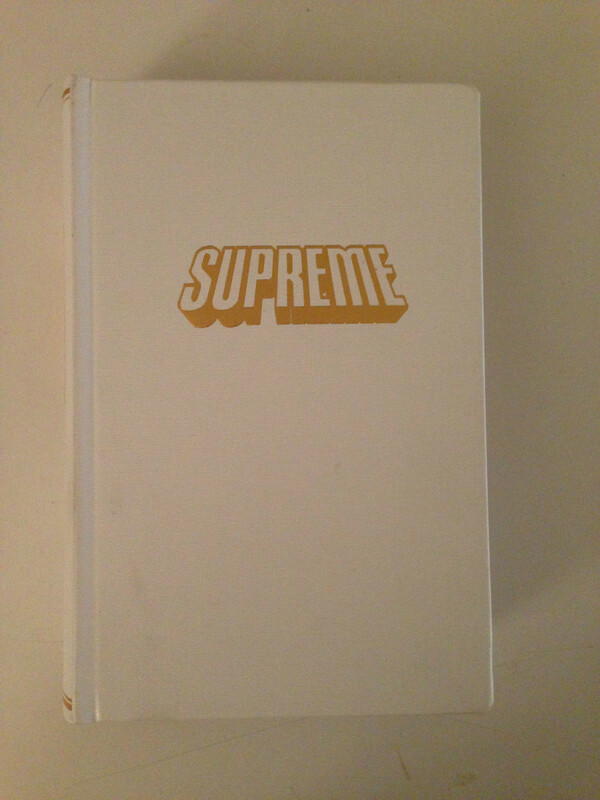 Further, included in his professionally bound hardcover was an exclusive copy of Supreme #41, signed by Alan Moore himself. Moore’s somewhat of a hard “get” when it comes to signed comics. I felt two ways about this book. On the one hand… it seemed absolutely insane to me that this fellow had spend so much time and money assembling this impossible collection. On the other hand… ME WANTEE! Going through the trouble to craft a hardcover collection is not something I’d ever do myself, but I can understand the impulse to create something like this. I came across this eBay auction this past weekend and I’m reasonably sure this is the same collection of the guy I met at the CCE. It ended at over $200 dollars, a sum I wouldn’t be able to afford if I had six months to save for something frivolous. I hope whoever bought it appreciates its’ obsessive beauty. Over the last three weeks, I’ve read The Lion, The Witch, and the Wardrobe by C.S. Lewis to Elliot and Henry… or, as Elliot thinks it should be called, The Wardrobe, the Witch and the Lion (in order of appearance). Elliot in particular has fallen in love with the book as I remember doing when I was his age. I decided to hunt down the 1988 BBC adaptation of the work I remember watching ad nauseum when it played on PBS. I didn’t want him to see the newer movie, which I also liked but seemed more concerned with inflated spectacle than adapting Lewis’ story. Anyhow, I found a copy and we watched it this week. I thought it held up, more or less… although there are some aspects which NEVER worked, even in 1988. The BBC’s solution to the many fantastic creatures was to use a mix of animation, animatronic puppets, and actors in costumes. Some of this is impressive, even by today’s SFX standards; this version’s take on Mr. Tumnus the fawn looks quite a bit better than the efforts of the newer movie. 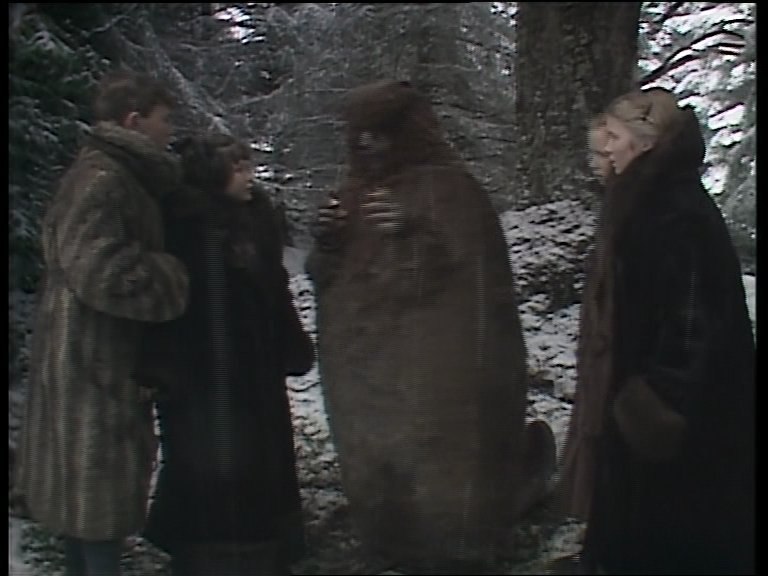 Some of it is so silly, like the full-sized beaver costumes which more closely resemble giant burritos. The best part of the entire production has nothing to do with effects, either practical or special. 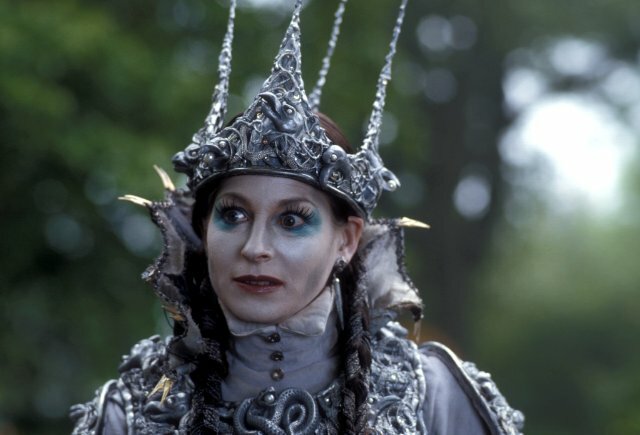 The best part of the TV version of The Lion, the Witch and the Wardrobe is Barbara Kellerman as The White Witch. Kellerman’s manic choices in her portrayal of the witch is broad and crazy… but it’s also quite effective. I think it still works. 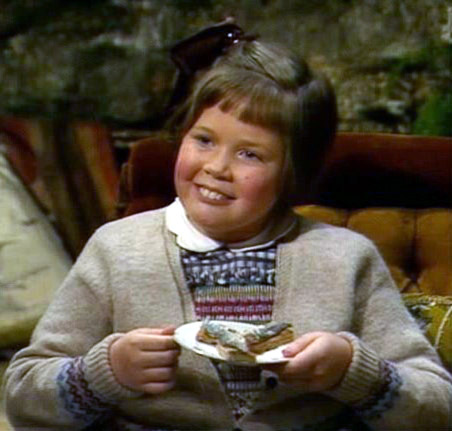 Oh, and the girl who plays Lucy has the craziest, best overbite I’ve ever seen on a child. First book of 2013: The Revolution Was Televised: The Cops, Crooks, Slingers and Slayers Who Changed TV Drama Forever by Alan Sepinwall. Sepinwall’s been a journalist and critic covering television for the better part of the last two decades and in The Revolution Was Televised, he highlights the major game-changers in that medium from the past two decades. HBO’s stable of dramas take up the lion’s share of Sepinwall’s attention (as well they should) although he does leave room for network series like Lost, 24, and Buffy the Vampire Slayer. Sepinwall’s prose is as engaging as it is in his online reviews but make no mistake – this isn’t just a case of a blogger repurposing old material. Lots of new interviews with the creators of these programs are included here along with the author’s observations. I found the book to be a fun, breezy read and I agreed Sepinwall’s idea that most of these shows were successful due to the creative control given to the auteur/show runners by the network. Outside of the nuts and bolts of Sepinwall’s writing, The Revolution Was Televised could also be seen as a bellweather for the world of publishing. The book was self-published by the author himself, bypassing many of the traditional hurdles normally presented by a project like this. The idea that a writer with some fan following could bring his work directly to the public isn’t exactly a brand new innovation to anyone but in many cases, I like the idea of supporting the writer directly. I believe I mentioned this over on Tumblr but not here: for Christmas, Ellen bought me the LEGO Haunted House I became so enamored with this past fall. It was a wonderful, thoughtful gift and I love the damn thing to death… although I’m not quite finished building the thing yet. Here’s where it stands as of today. As you can see, I have the first two floors assembled and I plan on finishing the house out this weekend. I’m enjoying the process; I can see why LEGO has so many fans across the world, young and old. Finally, I should point out my new phone purchase: I finally took the plunge and got me an iPhone. My phone use is rather limited during the week, as I turn it off at 7 in the morning and back on after school… but my old Droid had been giving me a lot of problems, especially with its’ camera function. Some of you have noticed the lack of chalkboard photos in the past few months. I stopped taking pictures of them because the phone on my old camera was so lousy. Hopefully the new camera means a return to chalkboard documentation. We’ll see! You are currently browsing the archives for the odds and ends category.